Business Card Style 12 that can be selected to make your own free business cards, there are many different styles you can choose from, the style example below is one of many that you can choose from. Some business card styles would benefit from changing various aspects of the business cards, but we didn't want to do that we wanted it to be an equal example with the other cards. 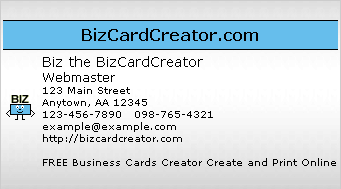 The image above is style example 12 of the BizCardCreator Free Business Card Creator style examples.